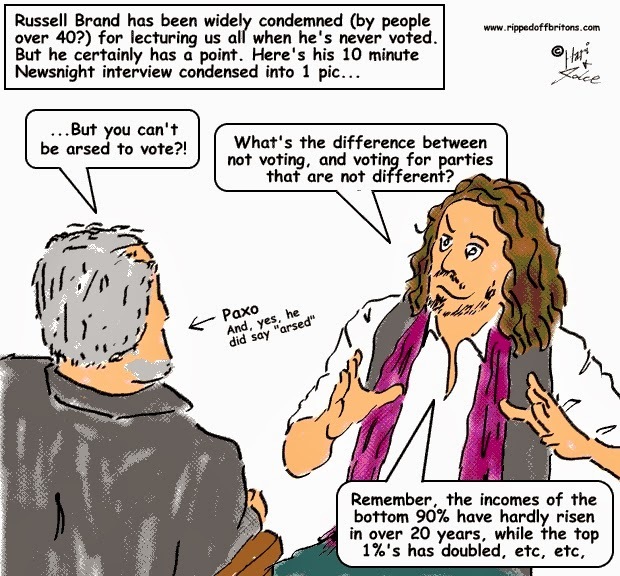 When Russell Brand told Jeremy Paxman there would an anti-capitalist revolution, the comedian was speaking for all those who despise what growing inequality is doing to their lives. Russell Brand is right of course, Labour and the LDs have moved so far to the right they are almost indistinguishable from the Tories. The problem is what will happen if a sizeable chunk of the youth take notice and don't vote? This disillusioned youth is unlikely to consider voting Conservative. Yet even a small drop in the anti-Conservative vote in marginal seats will yield big gains, exactly what they wan't! The rich will always vote for the hand which feeds them, the poor however are generally anti-political and need little incentive not to vote. Whilst it is at least conceivable that Labour could be changed from within, there is no way the Tories won't stop supporting their rich business friends. Unless Brand can be reasonably sure of overturning the system altogether, his policy is more likely to entrench the status quo. The answer is to encourage the spoiling of ballots on a huge scale, to the point where our wretched polititians recognise that the government is no longer legitimate. Sure it'll mean in all probability that we'll have an unapposed Tory government, but even they have shame, don't they...? Look at the current politicians, the expenses scandal, and their current attitude do you really think they have shame? They can't see beyond their own self-interests. Spoil your ballots in safe seats, if in a marginal seat vote carefully for the least bad candidate (there are even some decent Tories who are much more trustworthy than most of New Labour.) Or vote tactically - that is what got Caroline Lucas elected, probably. Having spoiled your ballot paper, photograph your protest, put the paper in the box and put your picture on the internet. My spontaneous reaction to Brand was,"Of course you should vote." However, looking at my 40+ years of voting, in not one case has my vote ever counted, wherever I was. My vote may literally have been counted, but otherwise it has been worthless. Whilst we need incentives to get on and innovate, create wealth, work hard, etc, (and that will mean extremely diverse income levels), we do need to have a more progressive tax system, e.g. richer pensioners paying National Insurance, reduced level of tax relief on pension contributions for higher rate tax payers, and in terms of the political system - change it from within - more independents and decent people in Parliament. Less 'professional' politicians that have never run anything in the real world. A revolution is unlikely, undesirable and would only lead to something worse in the long run - e.g. Zimbabwe!